With UTStarcom’s SOO solution operators can deploy highly efficient and flexible packet optical transport and access infrastructure, and optimize utilization of existing network resources. 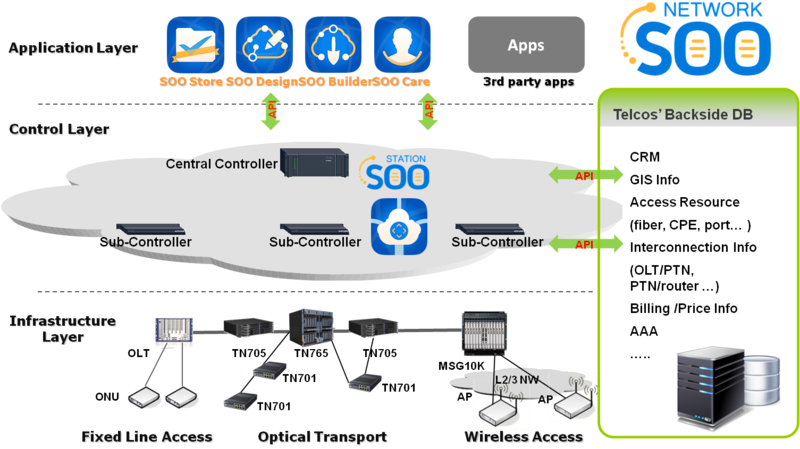 SOO solution supports automated end-to-end service provisioning, bandwidth on demand, network design and optimization on a network-wide scale for a converged virtualized network which can incorporate UTStarcom’s packet optical transport solutions, broadband access products and integrate 3rd party equipment via Southbound API. Special emphasis is placed on benefits that SDN brings to Packet Optical Transport – the core of metro networks. Our innovative implementation of SDN concept applied to industry-leading packet optical transport technologies creates a unique combination of SDN automation and flexibility with bandwidth efficiency and strong carrier-grade features of packet optical network. Decoupled control and data planes inherent into MPLS-TP and Carrier Ethernet technologies facilitates the natural migration of packet optical transport infrastructure to SOO SDN-enabled networking paradigm. Implementation of these concepts combined with industry-leading packet optical transport technologies creates a unique combination of SDN automation, flexibility and bandwidth efficiency with strong telecom-grade features including OAM, sub 50ms protection, QoS.